Hello! Hope you're all having a lovely start to the week. Summer has finally arrived in SE England and it's HOT meaning there has been limited progress with my blanket over the weekend. We were out for much of it and when indoors I was mostly painting a blackboard wall (more to follow on that in another post), then yesterday I was so BOILING hot the yarn was sticking to my hands and squeaking *shudder* so I only managed to finish off a couple before my patience ran out. ....can you guess my favourites? Although I have been making the middle sections 5 at a time from the same colour, the rest has been "random" but I seem to have rather a lot of purples and blues there, don't I?!? And poor old red - only three measly squares! So tonight I'll mostly be crocheting RED granny squares, and maybe a few pale pink ones too. 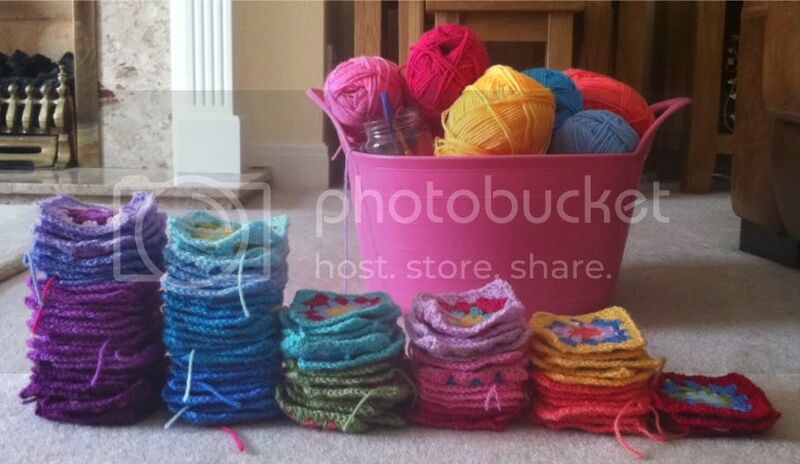 It's quite amazing that even after so many squares there's still so much yarn left - it almosts fits in the bucket now. I think I should have enough left for the borders. For 'WIP Wednesday' tomorrow I'll try laying them out in a few different formations (random? by colour?) before starting to join them so if anyone has any great ideas or any links to their Finished Objects that may provide inspiration in the meantime, please feel free to add them in the comments. this is beautiful! i have a granny square blanket from my great grandma and i love it. it is bright colors all trimmed in black. I spotted the helper!! So cute! I totally understand the heat thing. Ugh. You captured the whole sticky, squeaky yarn thing perfectly. Looking good Sarah! I agree the blues and purples seem to be a favourite - get some more yellow, green and red in there! Have you decided how you joining them all together yet? Hehe, I always do the same. When I knit stripes I always seem to end up overdoing the purple/green tones at the expense of the red/yellows. And wow, what a lot of work there. 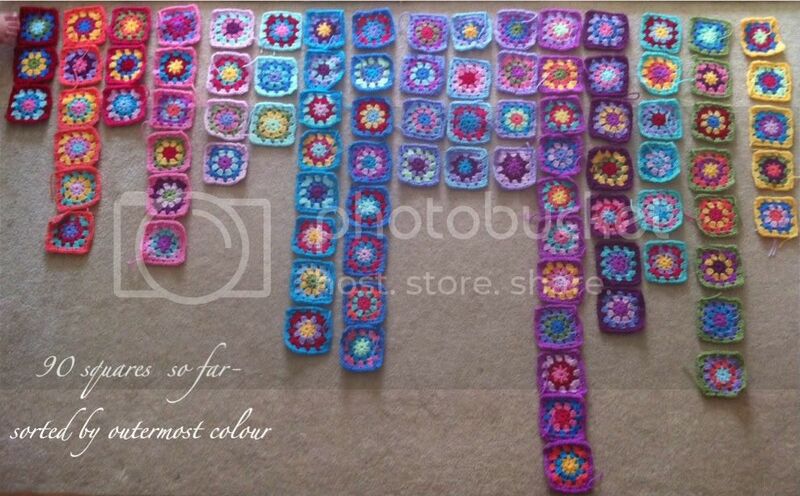 I've only just found your blog and i'm realy enjoying seeing the development of your blanket. I made 4 granny squares over easter but youre inspiring me to make enough for a blanket. It gets hot in SE England? I don't believe it! My parents told me all about English weather (I was too young to remember it myself) and, from what they tell me, it rarely gets above 30. Love the colours in the blanket. Good luck with the squeaky hook. I have tried crocheting in our summer (high 30s to low 40s here) and it's very hard. I find with lay outs, the best thing is to take photo of each lay out and just look at them on the pc to decide. You'll see how different it looks compared to real life. You get a really idea of what it looks like as a whole.